Hopefully, just like me… you would find the looks of that page rather interesting. At first it seems like someone sat down and spent a few lifetimes staring at a canvas and doing modern art with a very zealous attitude. But then, being a computer science major makes me turn around and find the words “fractal” and “recursions” rather contradictory to the whole artistic thing going on there. I don’t know much about art, but I do know that both the terms are often used in Computer Science. So, I discussed this with the friend who shared that link with me… and this is what I understood and gathered, after a very engrossing conversation and some googling! I would define fractal recursions as a rather interesting blend of math and computer science. All the images on that website were generated from simple math equations instead of a paint brush! Well, to be more precise, each one of those images in some way are extracted from an explicit or implicit mathematical operation that is recursive (or repetitive). Recursion is what happens when each part of a thing resembles the whole thing, only smaller and slightly altered. An example that made it easy for me to understand this concept was that of a wall and bricks. Each of the fractal recursions are basically like a wall… made of bricks of similar dimensions (or smaller “walls” in a weird manner of saying). 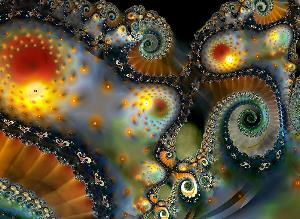 For those who find stuff like this interesting, you should look up: Mandelbrot Set. I need to get back to studying a random Software Engineering book, but shall get back to explaining more about this in another blog. Ciao!